This Quick Coupler Starter set is perfect for almost all PCP rifles and pistols and is a perfect accessory for the owner who has multiple probes/connectors. 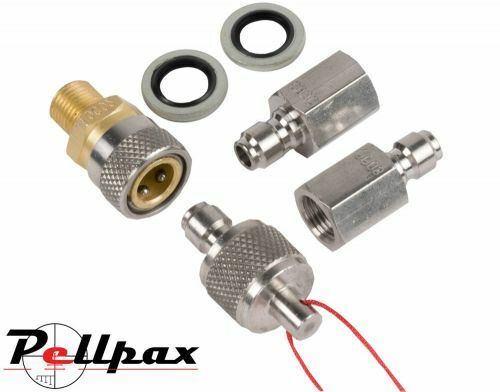 The set comes with a quick fill connector for your hose/pump, 2 x 1/8th BSP to Quick full plugs, 2 x bonded washers, and 1 x dust/test plug. The kit allows you to convert a standard 1/8th BSP fill probe into a quick fill connection so that you can quickly and easy change the probe without the use of spanners or tools. If you have more than 2 items, simply purchase more plugs to convert your whole selection of connectors into the beauty which is quick fill. All components have been tested up to pressures of 320 BAR, so whether it is a pump or a bottle, this a great kit.